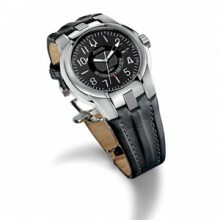 With a blend of cosmopolitan design and superior craftsmanship, Bulova Accutron, the global luxury brand of the Bulova Corporation, will be offering an expanded selection of rugged, yet sophisticated, Swiss Made men’s sport watches for Fall 2009, in both mechanical and quartz versions, including high-performance strap models in the Kirkwood and Eagle Pilot Collections. Providing two views of its 26-jewel self-winding, mechanical movement, with an on-dial aperture and exhibition case back, a meticulously detailed design from the Kirkwood Collection offers such sport essentials as an unidirectional turning bezel ring, luminous hands and markers, and water resistance to 100 meters, plus the reliability of a screw-down crown and screw-back case. 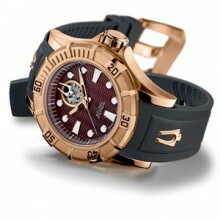 Crafted of stainless steel, with sapphire crystal and sculpted polyurethane strap, this durable and stylish timepiece is available as shown, with rose-gold finish and brown patterned dial and strap, as well as in stainless steel finish with black dial and strap, and in two stainless steel bracelet versions with blue or silver dial. For the vigorous traveler, a sleekly curving design from the Eagle Pilot Collection offers the convenience of a GMT dual time-zone movement housed in an elegantly stepped stainless steel case smoothly integrated into a padded and stitched black leather strap with locking deployment buckle. With luminous numerals, markers and hands on a patterned black dial, this superbly functional Swiss Made quartz timepiece includes an anti-reflective sapphire crystal, calendar, screw-down crown and screw-back case, and is water resistant to 100 meters. Also available with rose-gold finish and detailing, in a stainless steel bracelet version, and in several strap and bracelet self-winding mechanical variations. All styles in the collection, endorsed by Buzz Aldrin, pilot of the Apollo 11 Eagle lunar module, include this pioneering astronaut’s engraved signature on each case back. Alternatives: Solid stainless steel with black dial and PU strap; stainless steel colour with solid stainless steel link bracelet and choice of blue or silver colour dial. Alternatives: Rose gold colour IP case and detailing; solid stainless steel link bracelet; several strap and bracelet self-winding mechanical GMT versions in black IP solid stainless steel cases and detailing.